In the worst tragedy in 25 years at the annual Haj pilgrimage, over 713 Muslims were trampled to death and 821 others were injured beneath a crush of people making their way to a ritualistic stoning of the devil. The crush, in which at least 821 others were injured, took place on Street 204 of the camp city at Mina, a few kilometres east of Makkah, where pilgrims stay for several days during the climax of the Haj. Street 204 is one of the two main arteries leading through the camp at Mina to Jamarat, where pilgrims ritually stone the devil by hurling pebbles at three large pillars. Photographs published on the civil defense Twitter feed showed pilgrims lying on stretchers while emergency workers in high-visibility jackets lifted them into an ambulance. “Work is underway to separate large groups of people and direct pilgrims to alternative routes,” the Saudi Civil Defence said on its Twitter account. Panic ensued when a few pilgrims fell on a bridge, and others tried to escape the push of the oncoming crowd, authorities said. 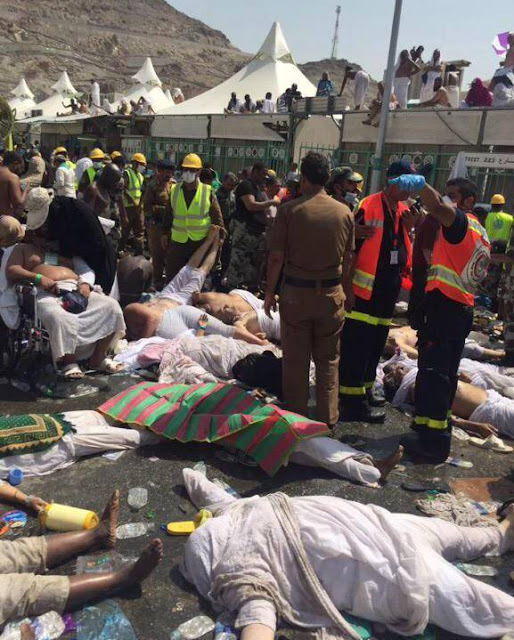 Safety measures were in place at the site – one where fatal stampedes have been frequent — but “caution isn’t stronger than fate,” Saudi Hajj Minister Iyad Madani said. The tragedy marked the worst disaster at the annual pilgrimage, or hajj, since 1997, when 340 pilgrims died in a fire at the overcrowded Mina tent camp. Seven of those injured today were in critical condition, Madani said. The site of the deaths was a two-story walkway in Mina, the location of the stone pillars where pebbles are thrown. The same area was the scene of deadly tramplings in 1998, 2001 and last year. “All precautions were taken to prevent such an incident, but this is God’s will,” Madani told journalists at a press conference. “The trampling begins with a small number of people falling, followed by a state of panic and an attempt to escape the crowd, which leads to an increasing number of victims,” he said. Most of the dead were pilgrims from inside the Saudi kingdom who Madani said may not have been authorised to participate. It was unclear how many foreign pilgrims died, but Egypt’s Middle East News Agency reported that 13 Egyptians were among the dead. On Monday, a fire forced some 1,500 people from their hotel in Makkah as pilgrims gathered for the annual pilgrimage. Four Yemeni pilgrims had sustained minor injuries following the pre-dawn fire in a 15-storey hotel, state news agency SPA quoted the department as saying.